Brady Bunte- Agave shortage could be a good thing for some. LAGUNA BEACH, CA, UNITED STATES, July 7, 2018 /EINPresswire.com/ -- Agave Shortage – could be a good thing for some. While most tequila brands are starting to sweat the pressures of the recent price spikes of Agave, Brady Bunte and Tres Sietes Tequila are not sweating it and have been preparing for this shortage of agave to happen for years. “We are in a great position right now” said Brady Bunte. We started acquiring and securing thousands of acres of select Blue Agave plants in areas of the Los Altos region. During this same period of time, we have had to increase our own production and we are now producing twice as much as we did last year to meet the increase in demand. We don’t take our tequila for granted! 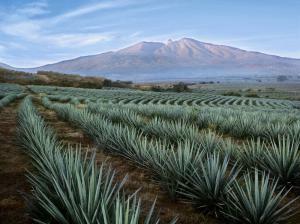 According to The Distilled Spirits Council of the US, tequila volumes have grown 125 percent since 2003. High-end brands alone have grown 295 percent. At the heart of that growth is the ultra-premium power-brand Patron. Exports to the U.S. for pure tequila skyrocketed nearly 200 percent in the past ten years, while it rose only 14 percent for cheaper tequila. Several distillers are now using 4-5-year-old plants because there aren’t any others. This early harvesting will mean the shortage will even be worse in 2019. Tres Sietes sticks to its strict formulation with the minimum aging of 8-10 years of its agave plants. The shortages will likely continue until 2020-21. Most don’t see the problem being resolved anytime soon and that’s what worries most of us. The shortage of agave also causes the farmers to guard their plants with armed guards. According to the CRT, last year 16,000 plants were reported stolen which is more than 3 times the number in 2016. This could be a good thing for company values for those that are positioned properly. Companies increasingly have to navigate the rising demands and costs. In January, Bacardi Ltd announced it would buy Patron Spirits International, a premium tequila maker, for $5.1 billion. Jose Cuervo just went public with a stock market launch in early 2017, and successfully raising over $900 million. “Tres Sietes Tequila continues to expand its distribution includes the US, Mexico, UK, Germany, and Colombia and we are looking forward to some great years ahead!”.